William Henry Webb, usually known as Chick Webb (February 10, 1905*–June 16, 1939) was an American jazz and swing music drummer as well as a band leader. 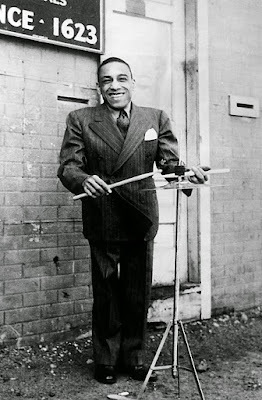 William Henry Webb (Chick Webb) was born in Baltimore, Maryland in 1909. Afflicted at birth with spinal tuberculosis which left him in poor health for his entire life, Chick was a small, hunchback of a man who possessed an “unconquerable spirit” and an astounding musical talent. For many jazz fans, Chick remains arguably the greatest jazz drummer to have ever played the instrument. Yet it was only by a quirk of fate that Chick even came to play the drums. The idea of playing the instrument was suggested to him by his doctor as a way to “loosen up” his stiffened limbs. 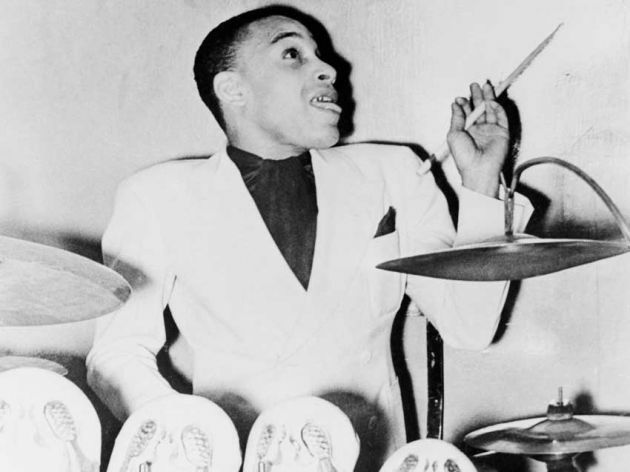 By saving money earned through delivering papers, Chick soon secured a drum set and by the age of seventeen, was playing in New York nights clubs such as the Black Bottom and the Paddock Club. 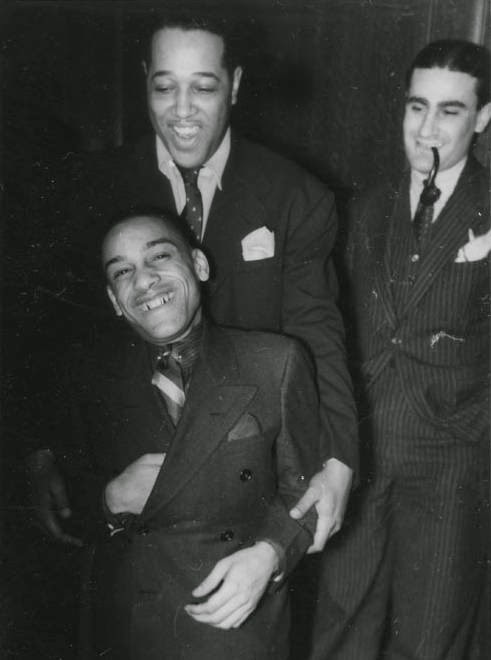 These early jobs were secured for him through the efforts of Duke Ellington who instantly recognized Chick’s talent. It was Ellington who encouraged Chick to form a quintet aptly called the “Harlem Stoppers.” The name was probably derived from Chick’s own hard driving style on the drums as the quintet’s leader. Later, this quintet would evolve into one of the most feared “swing” bands in New York -- The Chick Webb Orchestra. In 1931, his band became the house band at the Savoy Ballroom. 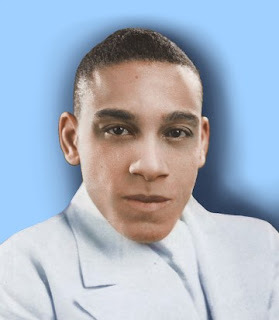 He became one of the best-regarded bandleaders and drummers of the new "swing" style. Drummer Buddy Rich cited Webb's powerful technique and virtuoso performances as heavily influential on his own drumming, and even referred to Webb as "the daddy of them all". Webb was unable to read music, and instead memorized the arrangements played by the band and conducted from a platform in the centre. He used custom-made pedals, goose-neck cymbal holders, a 28-inch bass drum and other percussion instruments. 1937. 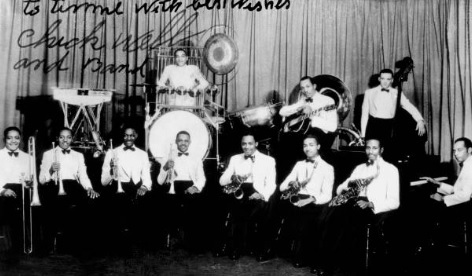 Although a judge declared Webb's band the official winner in 1938 over Count Basie's, and Basie himself said he was relieved to come away from the contest without embarrassing himself, surviving musicians continued to dispute the ruling for decades. 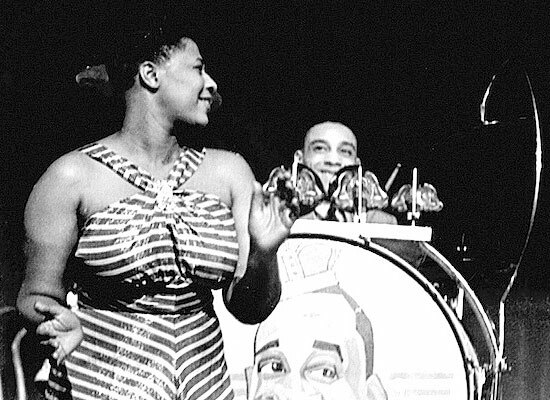 Chick Webb’s already mythical reputation was given even greater stature when he replaced his long-time vocalist Charles Linton with a then relatively unknown singer by the name of Ella Fitzgerald. 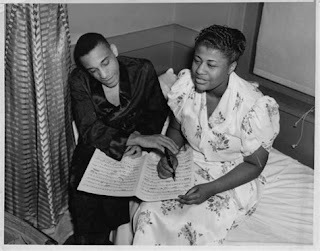 Jazz legend has it that Ella “snuck” into Chick Webb’s dressing room in order to convince him to take her into his bed. But legends notwithstanding, Ella did become Chick’s lead vocalist. And Ella, called adoringly by fans and musicians, “The First Lady of Swing,” always acknowledged Chick Webb as her “first and foremost” influence. Together, Chick and Ella, would electrify the Swing era of jazz with hits such as "A-Tisket a Tasket," which was composed by Ella to cheer Chick up while he was ill. And while this and other great tunes recorded by these artists are well-known, Chick’s early work -- some say his most impressive solos -- was regrettably poorly captured by recording technology ill suited for Chick’s immense talent. But one of Chick’s hit tunes “Stompin’ at the Savoy” gives contemporary jazz fans some hint of the power of Chick Webb and his Orchestra. 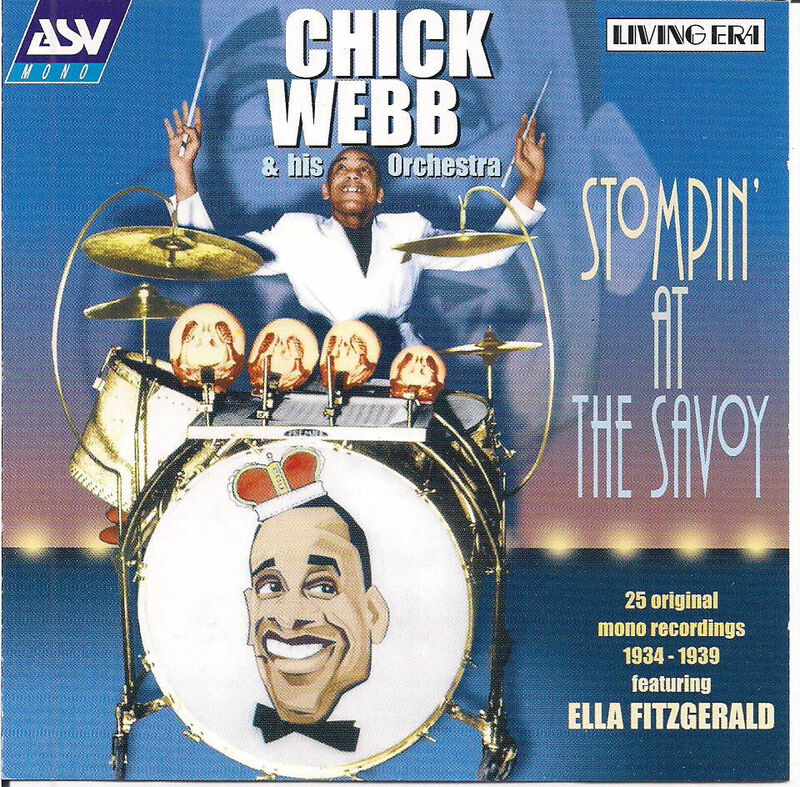 In 1938, Chick Webb’s health began to fail him. This was mostly due to Chick’s chronic spinal condition and his insistence that he and his orchestra would only perform at the height of their talents for their fans. Often it was said that Chick played with such power that he was physically exhausted when he left the bandstand. Finally, he had a major operation at Johns Hopkins Hospital in Baltimore in 1939. Webb died from spinal tuberculosis on June 16, 1939, in Baltimore. Reportedly his last words were, "I'm sorry, I've got to go." He was 34 years old. Webb was buried in Baltimore County, in Arbutus Memorial Park, in Arbutus, Maryland. For awhile, Ella Fitzgerald carried on Chick’s tradition when she became one of the first female bandleaders. But soon the orchestra became too much for Ella to handle. Finally, the band went under. But not after it left a jazz legacy that has been recognized by such jazz greats as Buddy Rich, Louis Bellson, Art Blakely, and Duke Ellington. 12. Clap Hands, Here Comes Charley! Diminutive fireball Chick Webb led the most explosive swing band of the '30s, and though the group was far too active to enter the studio as much as they deserved, it's easier to sum up their recordings with a single disc. (In fact, the completist Classics series needed only two volumes to sum up Webb's decade behind the drums of his own band.) ASV/Living Era's wrap-up, titled Stompin' at the Savoy, does justice to his legacy with nearly every prime side: "Harlem Congo," "Clap Hands! Here Comes Charlie," "Blue Minor," "Liza (All the Clouds'll Roll Away)," "Sing Me a Swing Song (And Let Me Dance)," and "A-Tisket, a-Tasket" (the latter was a breakout commercial hit for not only Webb but his girl singer, Ella Fitzgerald).